Submitted photos A Cedarville engineering student races his boat during Solar Splash. The world championship Cedarville team. Cedarville team members make final adjustments before racing. 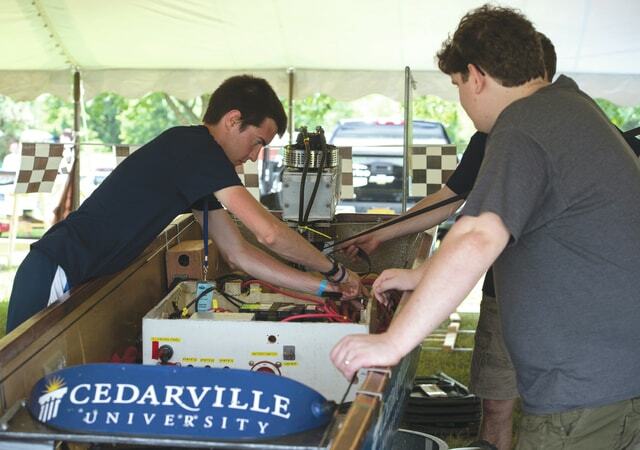 CEDARVILLE – Engineering students from Cedarville University won World Solar Splash championship at Eastwood MetroPark this past weekend. In claiming its eighth title in 12 years, Cedarville amassed a score of 932.44 points out of a possible 1,000 over the four-day event. Middle Tennessee State University (802.54) was a distant second followed by Geneva College (740.69). Cedarville – the winningest team in Solar Splash history – won based on victories in the endurance, qualifying and sprint events. In addition to winning the on-water competition, Cedarville also won awards for outstanding technical report, outstanding system design, outstanding electrical system design and most improved team. Solar Splash is an event that tests the engineering design and production skills of each team through a technical inspection and a series of on-the-water competitions. Each team is required to produce a piloted boat up to 6 meters in length powered by 480 Watts of solar power with one kW-hr of stored energy in batteries. Teams earn points based on their performance in a qualifier, high-speed sprint race, long endurance races and slalom event. The event judges also review technical reports submitted by each team, which factor in to the final score.